A brief history of the Wolftone pedals: in the early 2000s, Studio Electronics released two Todd Wolfgram designed effect pedals, the Wolftone Helium and Wolftone Chaos. These pedals have since earned almost mythical status due to their intense distortions and unique sound. Now, after months of close work with Todd, this updated version of the legendary Helium features a second Wolf setting to augment the original pedal's two-position octave sonic palette and has been designed to operate with a ˜standard' 9v neg tip power supply. 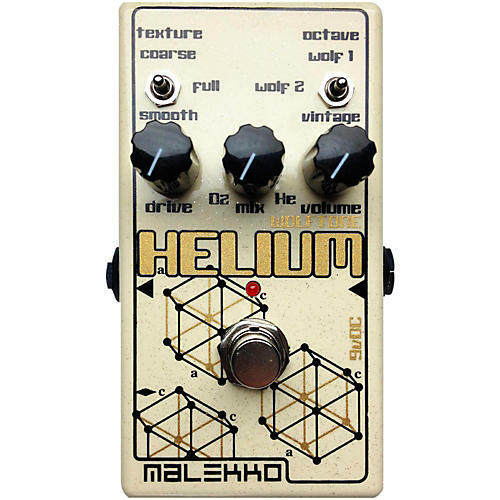 The Helium MKII is an Octavia style distortion pedal coupled with an intense octave up effect. Its Texture and Octave switches will take your sound from a vintage Tychobrae scream to a clear, sweet, singing octave, while the ˜Mix' control lets you blend your distorted fundamental note into the effect. The interaction of gain to dynamic response work together to make the Helium MKII the most versatile and pivotal "octave up" pedal to date.